Easily transfer photos, data, videos and music to and from your computer with the USB 3.0 4-Port Hub. Equipped with a OTG interface, support OTG function so that the smartphone can read the USB disk data. With compact size, it is perfect for all your travel needs and supports high-speed data transfers with no software to install. 4 USB 3.0 port hubs, compatible with both USB 1.1 and USB 2.0, supporting high-speed data transfer up to 5.0Gbps. USB cable takes electricity directly without any external power source; it supports hot plug without any other driver. Equipped with a OTG interface, support OTG function so that the smartphone can read the USB disk data. Compact, lightweight and portable design, equipped with a blue indicator light, perfect for your travel needs. 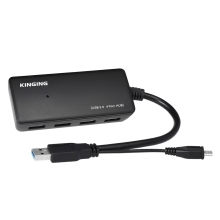 USB3.0 HUB computer extension, suitable for USB external devices such as mouse, keyboard, U disk, card reader, printer, cell phone, camera, tablet, game console and so on. Note: The OTG function can be used for the smartphones in which OTG is supported.